This week's lesson was about how Jesus is the light of the world and that we should also light our world with His love. In John 8:12, Jesus tells us that He is the light of the world. In Matthew 5:14, Jesus tells us that we are the light of the world. If He is the light of the world, then how are we also the light of the world? This question took me back to a couple of years ago when Sassy was in kindergarten. Her kindergarten curriculum taught this truth so completely that I was really able to understand it. Jesus IS the light of the world, like the sun lights our physical world. The sun is the light source for our solar system. We are also the light of the world, but like the moon. The moon gives off no light on its own; it only reflects the light of the sun shining on it. We should be reflecting Jesus in our world. 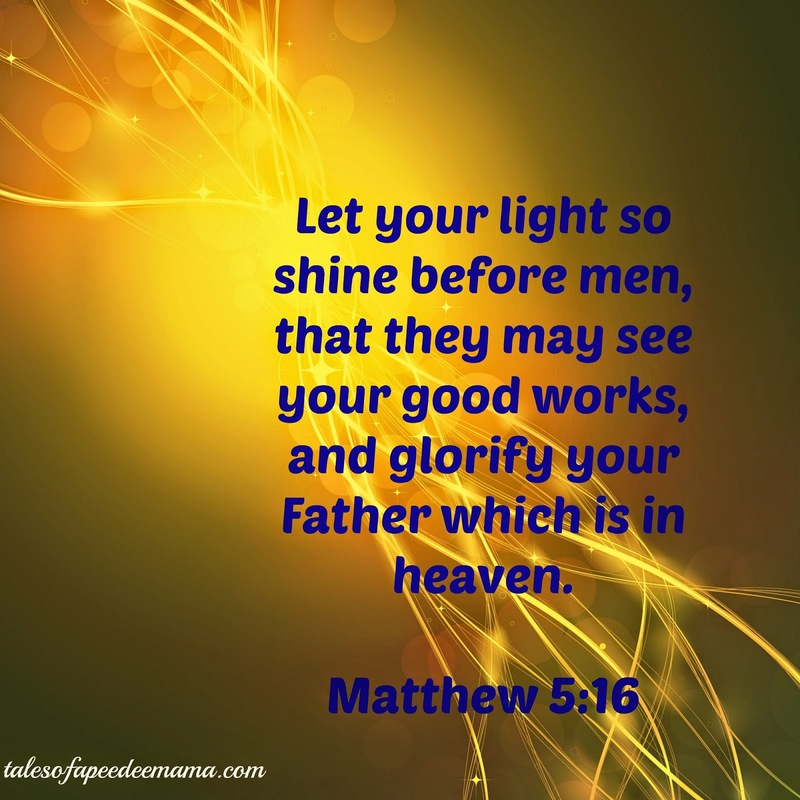 Matthew 5:16 tells us that our light shines through our good works. If we are followers of Jesus, those around us should see Jesus in our words and actions. We each have a circumference of light around us. This circumference surrounds us wherever we go, and those who are close to us as we go throughout our day should see that light. This really made me reflect and ask myself, "Is my light shining brightly EVERYWHERE I go? Or are there some times and places where I let it get dimmer?" My goal is to shine my light with good works everywhere I go.